Well this was a trip down the memory lane... 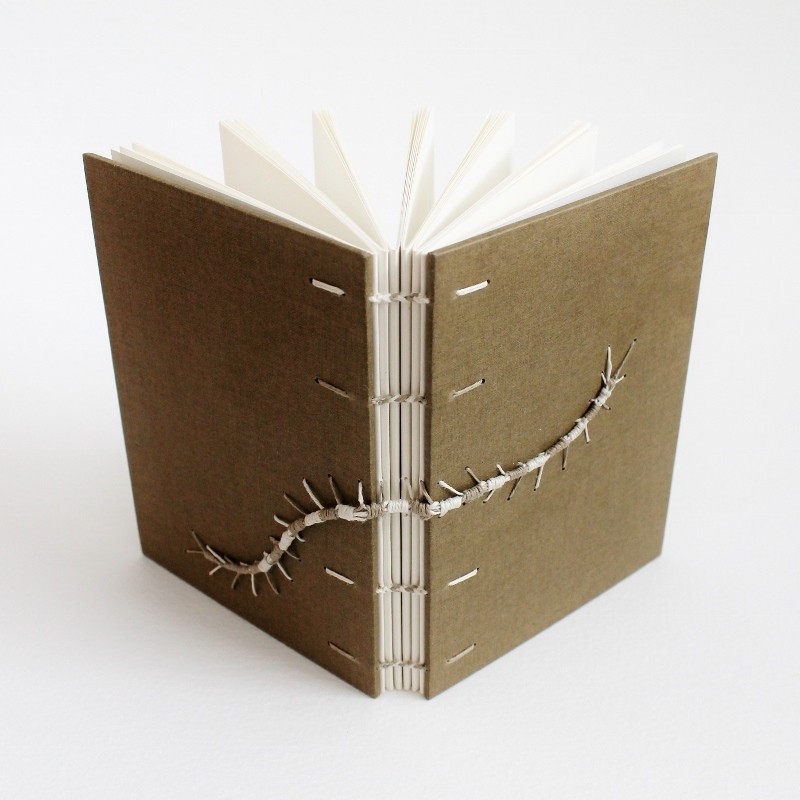 The last time I made a book using the caterpillar stitch was in 2004 or 2005 when I was still a bookbinding student. Some things get better with age - and some things don't. This project was a fail, at least to me, no matter how it looks at a first glance. I ambitiously went with a very curved design and remembered too late that there was a very special(=tricky) way to keep that core somewhat centered along the curves. Now my centipede/caterpillar looks like it's missing some legs at the inner curves, and the tension at the spine also leaves a lot to hope for. The front cover fails to stay properly closed, but at least it's much better than some caterpillar stitch books that fail to close at all. In the caterpillar stitch the stitches that form the legs are done first and the core wrapping takes place a few steps later, making it pretty difficult to estimate the perfect amount of tension in the stitches done first, especially when it's been 10+ years since the last attempt to get it right. 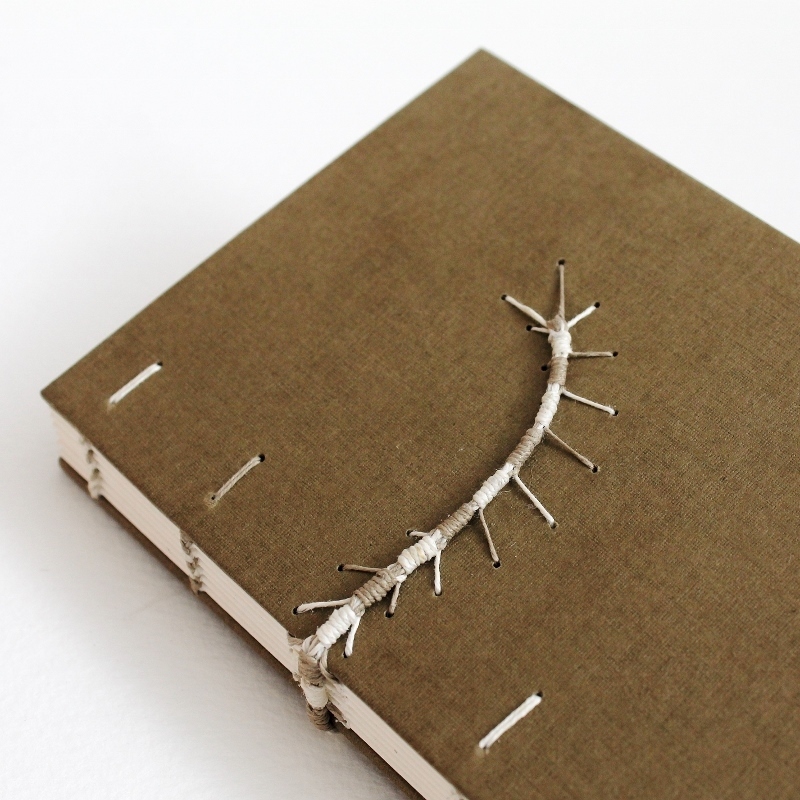 So, I ended up with a deformed bug and a slightly too tight stitching on the spine. But I did do some things right, so let's focus on those things a bit: The caterpillar stitch alone is very unstable, so it's advisable to use other stitches to support the spine better -> the four-needle Coptic binding did the job perfectly. Using another method for the primary binding meant I didn't have to sew the caterpillar through each and every signature on the spine -> the caterpillar core looked pretty balanced even as it crossed the spine. Mind you, I didn't count the number of wraps I did around the core at each section as I wanted some variation along the length of the core, so that variation helped with masking some uneven distances between pairs of legs, too. Now I've checked one more bookbinding technique off my list of things to try again/learn for the first time, but I'm not sure this one made much sense. 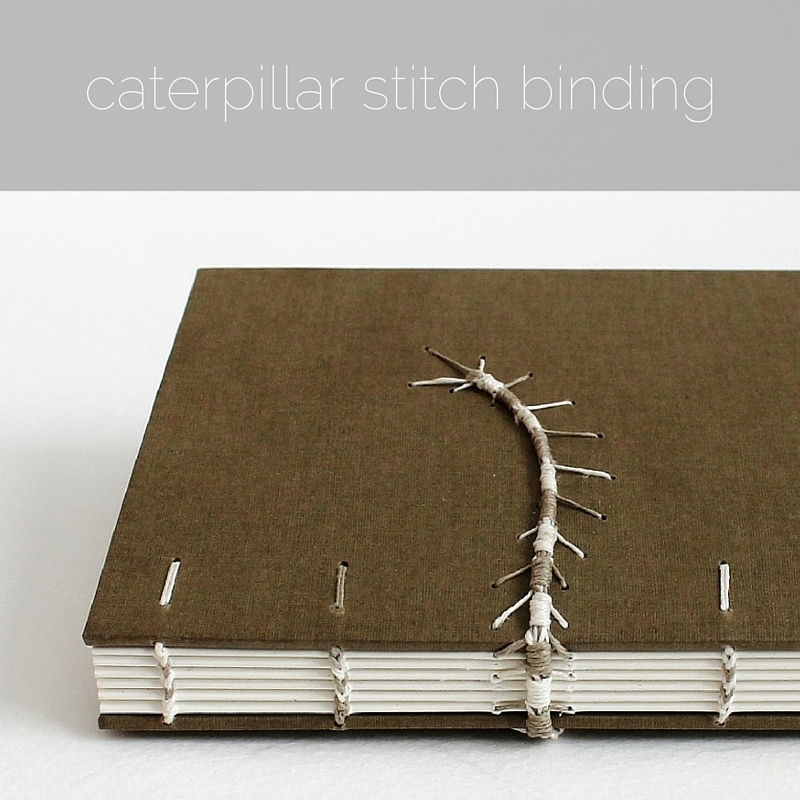 I've seen some pretty cool books with caterpillar stitch - it works with a more rustic look than the one I usually sport, and it can be just the thing to add as a detail to an artists' book. The caterpillar stitch gives you a pretty unique look, but I don't really know why one would want a caterpillar on one's book to begin with. The stitching is pretty impractical in its bulkiness and predisposition to excessive wear, so, in my books, this falls into to the try only for curiosity section of bookbinding structures. It can keep company to the crisscross binding (formerly known as the secret Belgian binding) there. To be honest, the success of the crisscross binding in the craftier bookbinding circles is pretty baffling to me. I get that glueing can be scary and it's easier to begin learning bookbinding by trying out book techniques less likely to totally fail than casing in hardcover books, but still, that book basically comes apart when any single one of the very much exposed threads breaks from continuous friction. Again, I'm all for variety in bookbinding structures, but this is another technique that I'd much rather see used primarily for artists' books as they are handled much less often and more carefully than any notebook ever.